If you are waiting for the HTC Vive VR headset to be available for pre-orders, we have some good news today. The company has announced that the device can be reserved starting on February 29th at 10am EST. This is for the final consumer version of the Vive, which has some added features compared to the Vive Pre that was on display at CES in Las Vegas last month. The price of the HTC Vive will be $799. Among the new features added for the consumer version of the headset is phone connectivity. You will be able to pair your iOS or Android phone to the device using Bluetooth. This will allow you to receive calls and messages even when you are "in another world." And with the built-in microphone, you will be able to respond to those calls without having to remove the headset. Compared to the Vive Pre, the consumer version of the device has a sleeker look with a more-rounded design. There are two gaskets being offered that allow the headset to fit different size faces. The Vive will be available in 24 countries for the initial pre-order period, including the U.S., U.K. and parts of Europe. So what exactly are you getting for your $799? In the package comes the VR headset, two room sensors, two wireless controllers and all of the necessary connections allowing you to hook up the device to a PC. While any set of earphones will work with the headset, HTC includes a pair of ear buds in the box. And those who reserve the HTC Vive will receive two titles to jump start their Vive experience, Job Simulator: The 2050 Archives, and Fantastic Contraption. You will need a PC with a specific graphics card (possibly the Nvidia 970 or AMD 290). HTC will release in the future, the specific specs required for the headset. Shipping is expected to start in April. 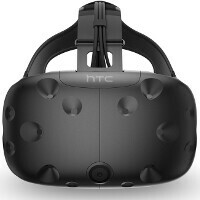 Last month, HTC CEO and co-founder Cher Wang said that creating connected virtual reality devices is more important to HTC than producing smartphones. Will she still feel the same way after the Vive has been released? Lol wtf. $799, does it come with a M10? If Sony could keep it to $399 with one good launch title than there is still be hope that VR will gain main stream developer support. I'm not too up to date on VR. So I wouldn't understand the pricing. But if Samsung is throwing in a free Gear VR for preorders of the S7, then this must be leaps and bounds better? Well, the Gear VR uses the actual phone as a display, while the Vive has its own. Not to mention the fact that the Vive will be leaps and bounds better than the Gear in terms of head movement tracking, amongst other things. Whelp, that's expensive, wonder how they are going to compete with Oculus, though I suppose they have the whole improved sensors and motion control, and much larger area. Damn that's high but hey if it ends up being better than all the other vr headsets then I guess its justified. samsung is given a VR for free with a 650 $ phone and HTC is selling the VR alone by 799 ! am I messing something or my calculations are right !! AHH, so a standalone VR system that doesnt need a phone. Pricing is justified. Just like when the first gaming consoles were released. Remember that you ll also have to invest in the pc if you dont already own one with a good config. Its fine for me as i update my gaming pc at least once an year. For a person who doesn't own a good pc,price ll probably be around 2000 bucks at the least. 800...Pass, for now. Down the road if its priced at a lower price I'll take it.